We are having a little handmade ornament swap in the LMQG this month. It’s a secret swap, which is always fun. Right up until the moment when you have a panic attack just before handing over your item. Please tell me I’m not the only one. Anyway, when I saw this completely adorable angel I knew it was perfect. I cut out all the little bits of felt before I went to Market and then carried them all the way there and back again without actually taking the bloody thing out of my bag. Unsurprisingly. I really hope my partner likes it. Not least because that gold thread is a total pain in the arse to work with. Seriously, it had me swearing. If anybody knows of a decent gold embroidery thread (that isn’t DMC) then please let me know. 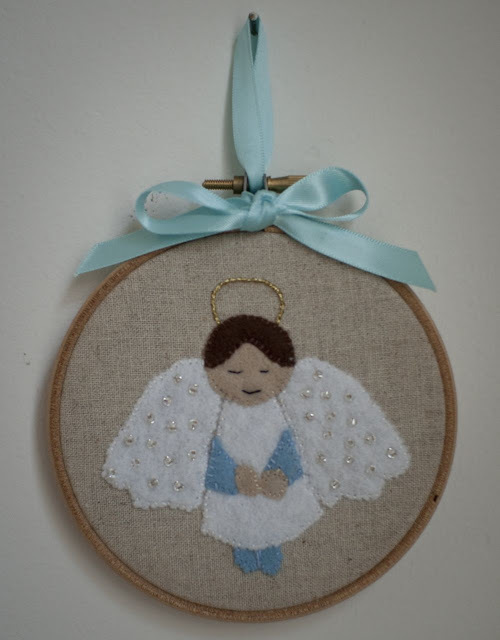 You never know when I might get the urge to stitch up a whole load of tiny haloes.